” Animal Experimentation Adverts contribute towards site running costs, but currently may not fit with the site ethos. We will continue to work on a solution. Animal Experimentation IS NOT REQUIRED to advance human medical science in modern society. Because humans respond so differently to other animals, using other animals to test on is unreliable at best, and fatally dangerous at worst, for humans. Cruel beyond words, the torturing and sacrificing of animals is what goes on in hidden laboratories in Research Facilities every day. 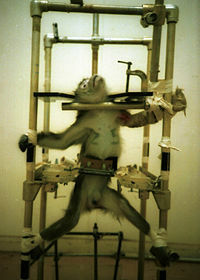 Vivisection means the cutting up of a living animal. Animals are dissected, infected with diseases, burned and blinded to name but a few of the atrocities that are inflicted on these poor defenseless animals. 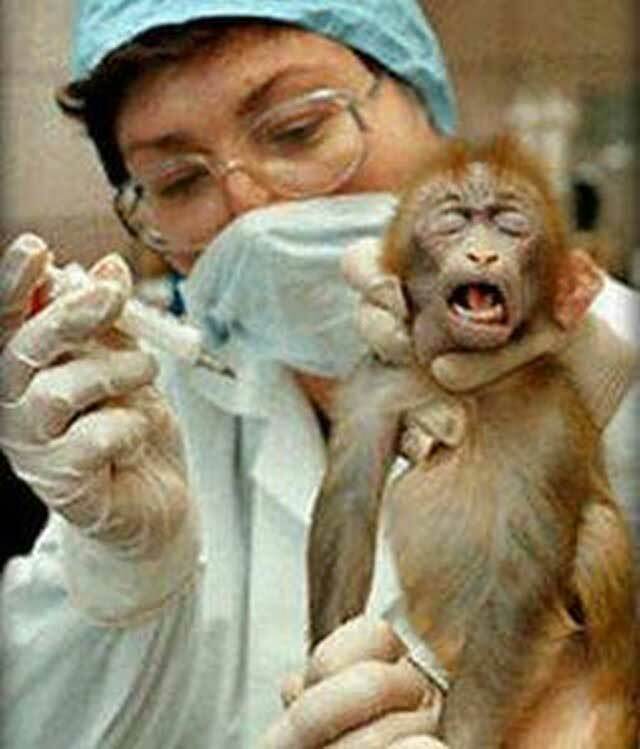 vivisection hinders medical advancement and is risky for humans because the results of this sadistic research cannot be applied to animals. What the Scientists also fail to tell you is that advances such as curing cancer in mice has been in place for years, but cannot be transferred to humans. All that time wasted, and cruelty inflicted, and absolutely no progress made in treating and curing cancer in humans. This page brings you the TRUTH about what goes on in Research Facilities. Animal Experimentation is disgustingly wrong, and must be stopped, NOW. To name but a few. They suffer unimaginable psychological and physical suffering. Albino Rabbits, and Dogs, for example, are often used for the Draize acute toxicity test. This is where a substance such as a cosmetic or food ingredient is dropped into the eye or on the skin of a restrained, conscious animal, left for a while then removed to record its effects. Effects can range from redness and swelling, to haemorrhaging and blindness. The animals are killed if they do not recover, otherwise they are tested on again. The pain they experience can only be imagined. The Lethal Dose 50 Percent (LD50) test is where Rabbits, Dogs, Cats, Mice and Guinea Pigs are used to test lipsticks, skin-care products, shampoos and nail polish. Ingredients equating 50% of the animals body weight is forced into the animal orally or intravenously. 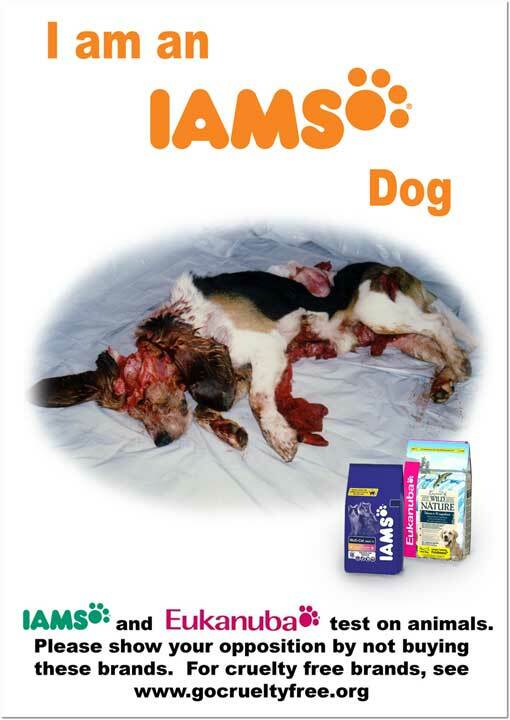 The aim is to find the dose which kills half the animal sample, which is a minimum of 50 animals per experiment. The multitude of tests that are conducted on animals is truly sickening. Monkeys are documented to have lost fingers and limbs through testing, and even through the lack of care they receive after testing. For example, bandages are not applied to the burned body of the animal after chemical testing. This leads to infection and disease, not to mention the pain and distress they suffer. The testing of cosmetics, household cleaners, and surprisingly, dog food, results in millions of animals suffering and dying from poisoning and burning every year, at the demand of cruel corporations. These corporations are the owners of leading, well known brands consumers buy. 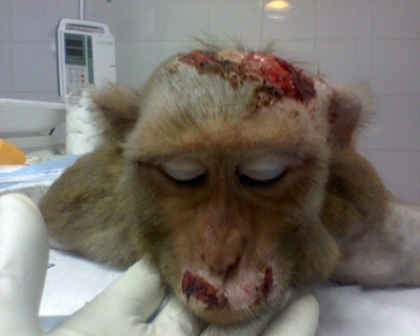 The animals in labs are also often treated appallingly even before any cruel testing is carried out. They are often abused by their captors, starved and imprisoned in small cages, only taken out for the torture of animal experimentation. 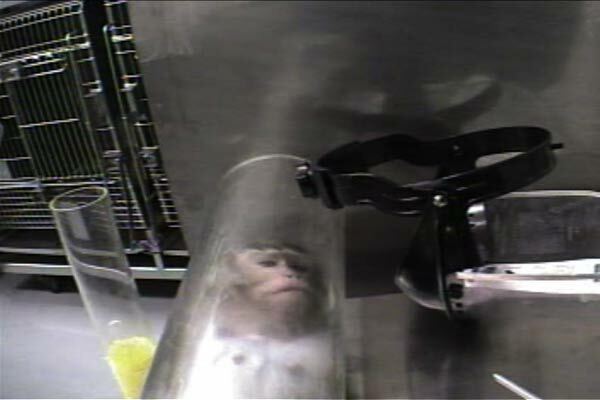 During the animal experimentation the animals are often put into restraint tubes or other types of restraints so they have no way of escaping the pain. Other types of experiments include drug injection into sheep, cattle and other livestock to see if more milk can be produced, or enlarge the animal for more meat. Animals are injected with morphine and other drugs just to see the impact of addiction and the withdrawal process. Many animals have died this way, in the name of science! 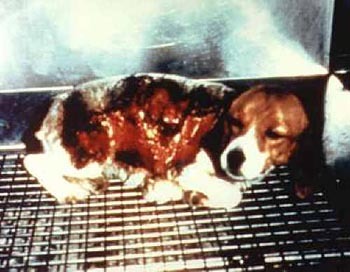 In 2010 the UK Government annual statistics revealed that over 3.5 million animals suffered and died in lab experiments. 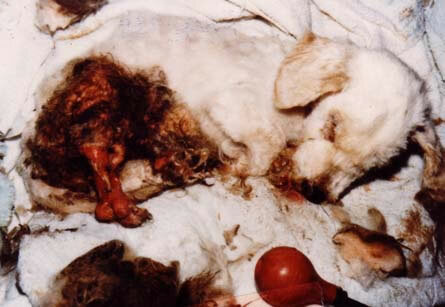 Up to 8 million animals bred for testing were destroyed because they were surplus to requirements! Testing on humans is OK after we give our consent. No one asks for the consent of all the other animals. What gives us the right to do this? Human Beings – the most despicable animal on the planet! 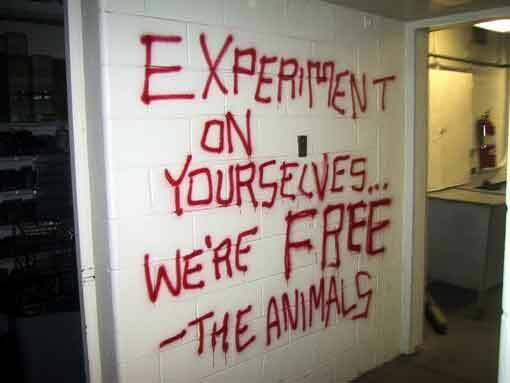 "Ask the experimenters why they experiment on animals, and the answer is: "Because the animals are like us." Ask the experimenters why it is morally okay to experiment on animals, and the answer is: "Because the animals are not like us." Animal experimentation rests on a logical contradiction." Here we look at some of the appalling treatment of animals is laboratories, research facilities and other areas in the name of corporate greed and medical advancement. Remember Thousands of animals suffer this way every day! Can you image their suffering and the pain, confusion and terror they are feeling? 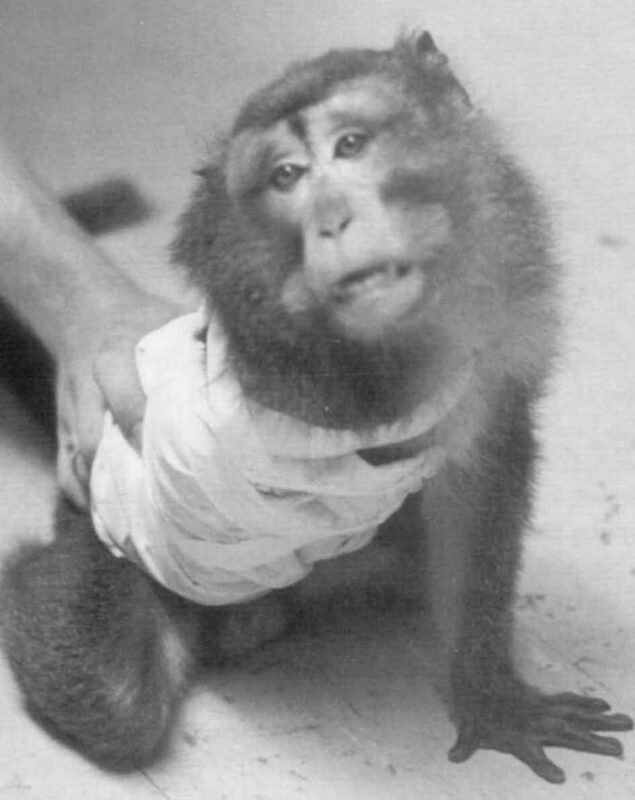 The photograph below is of a young monkey earmarked for vivisection in the Royal College of Surgeons Laboratory in England, UK. The Scientists tattooed the word CRAP onto the monkeys forehead. This just goes to show how contemptible the medical world thinks of all our fellow animal species. Prof. H. Harlow, famous vivisector of non-human primates in an interview that appeared in the 27th October 1974 edition of the Pittsburgh Press Roto. Also quoted by H. Ruesch in “Slaughter of the Innocent”, 1983, page 52. The Institute for Behavioural Research, monkeys have their spinal nerves severed to render some of their limbs permanently paralysed and useless. They are then subjected to abuse such as electric shock treatment and food deprivation. If they do not regain the use of one of their limbs, they starve! They are kept in dark chambers and electrocuted to try to force them to use their disabled limbs. According to the PETA.Org report, the chamber they were kept in was covered in blood. 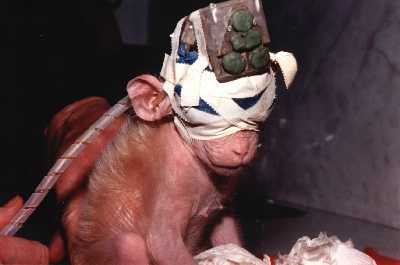 Vivisectors had sewn a baby monkeys eyes shut and grafted a device to her head in the photographs below. 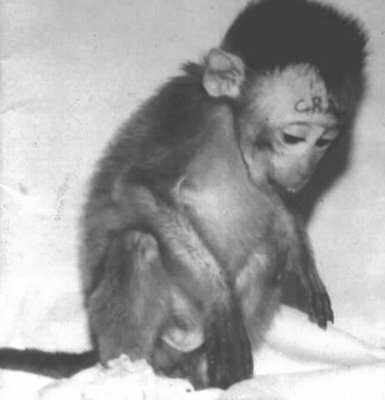 The baby monkey was rescued from the University of California at Riverside Laboratory in 1985. In 2005, the U.S. Department of Agriculture charged the University of California with 89 violations of the federal Animal Welfare Act (AWA). However, instead of defending themselves in court and revealing their mistreatment of animals, they decided to accept a $92,500 fine. Clearly the consequences need to be raised. Some animal rights groups take matters into their own hands and break into research labs to free the animals, so they don’t have to suffer from animal experimentation anymore. Of 172 officers interviewed, eight said there were 14 instances in the past three years where they had been told not to present their opinion to an advisory committee if it would reduce the likelihood of a drug’s approval. But, all 12 of these compounds were chemical variations of previously known chemotherapeutic agents. The fact that these chemicals could be used to fight cancer had already been predicted by their chemical structure. In other words, for 15 years, billions of dollars of investment money was ploughed into subjecting millions of animals to the most painful, cruel and barbaric procedures and then killing them, all of which proved nothing new. Both healthy and diseased tissues donated from human volunteers can provide a more relevant way of studying human biology and disease than animal testing. A sample of water is injected into the abdomen of a mouse. No anaesthetic is used. She displays disorientation, paralysis of hind limbs, breathing difficulties and a violent jumping reaction. She becomes unresponsive and cold to the touch. Within 5 hours she has died from heart failure. 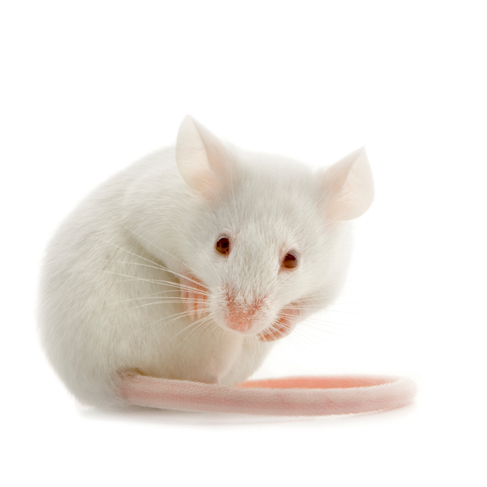 Internationally, and now, within Australian water authorities, the mouse bioassay has been replaced with a number of alternatives, including the Elisa test – a similar technology to those used in home pregnancy tests – and the Lawrence Method (HPLC). These methods have proven to be far more accurate than the mouse bioassay which was often criticized for its inconsistency between laboratories. Other ways to stop animals being used for experimmentation are detailed in this excellent article by the Physicians Committee for Responsible Medicine. The frustrating thing for me is animal experimentation can so easily be avoided and replaced with advanced humane, non-animal methods. The belief that animal experimentation is necessary to progress medical research is wrong. In fact, what produces positive results in animals, can prove to be very dangerous to humans. This is where research is conducted in external, controlled environments such as a test tube. It is a proven technique that produces very accurate results for medical research. Penicillin is just one of thousands of treatments for humans that were discovered through In vitro research. Why experiment on an animals when this works better? 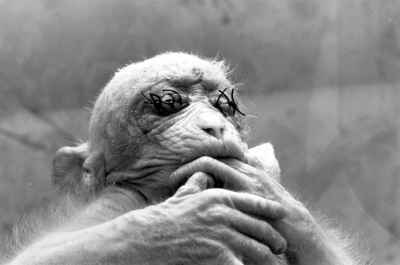 In addition drugs like Thalidomide, Zomax, and DES were all tested on animals and judged safe. We know now this was very much not the case. The technology available to research scientists, chemists and others from the medical and commercial worlds really does negate the need for animal experimentation. MRI and CAT Scans, DNA Sequencing, Advanced Microscopes and X-rays all enable the medical world to look inside the human body. New computer power and advances in Mathematics have resulted in new treatments for diseases such as breast cancer and AIDS. New prosthetics for people who have lost limbs, or who have broken their backs and also on the market today. No animal experimentation needed! Epidemiology studies diseases in the human body. This techniques discovered links between diet and heart disease, and smoking and lung cancer. Genetic research identified human predisposition to hereditary problems such as cancer and heart disease. Advances in DNA technology may lead to cures for such conditions. The scientists that use DNA sequencing in animal experimentation are really wasting their time. Why not study humans instead? Clinical Studies observe and analyse patient conditions to advance solutions to given problems. Leukaemia, thyroid disease and HIV therapies have all come from Clinical studies. Autopsies identify and clarify human diseases with absolute clarity. They are expensive, but the research information that can be found from them are worth the investment. I am please to say that some Countries in Europe have diverted funds from animal experimentation to autopsies with positive results. This is a system that enables the general public to report on the effects and side effects of approved drugs. This enables the research labs to refine the safety of such drugs. There are lots of things you can do to support the discontinuation of animal experimentation. Take a look at the Cruelty Free Shopping page to find out if you are inadvertently supporting the vivisection industry with your consumer habits. Another page to look at is the Donate Saliva & Body Tissue page, which has different suggestions of how to help. If you would like to know if the charity you support undertakes medical research on animals, see this page: Support Only None Animal Testing Charities. If you would like to learn of numerous ways you can help stop animal cruelty in general, this page has all sorts of suggestions: Stop Animal Cruelty. 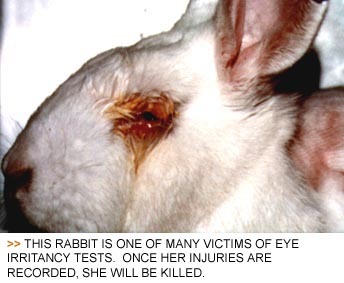 A list of Companies that test and do not test on animals is provided in this blog. Learn who you are giving your money to. You may be supporting the vivisection industry without realising. On this site there are many varied ways you can help stop animal cruelty, and there are ways that will suit everyone, no matter what your personality. Help animals further by sharing the ways to stop animal cruelty you learn with other people and on social media. Doing this could mean more people help stop the cruelty, and therefore you are responsible for more animals being saved from suffering.